Paint, Draw, Color, Create with the Guidecraft 4-in-1 Flooping Floor Easel! The drawing panel quickly flips" from chalkboard to magnetic dry erase and brings the paper roll along for the ride. 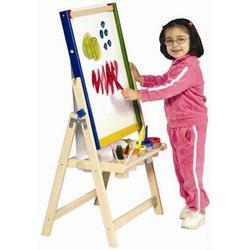 The 4-in-1 Floor Easel by Guidecraft is an innovative design to inspire your little artist. Dimensions: 16 1/2"W x 25 1/2"D x 42 1/2"H.
Replacement roll size is 15" x 200.